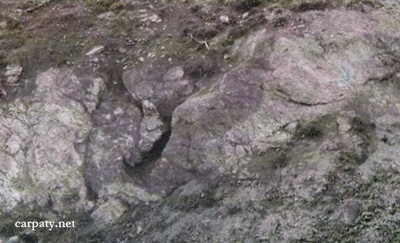 Regional Information Center "CARPATHIANS" » EOCENE ROCKS OLISTOLITES. 48° 44′ 29″ N lat; 23° 04′ 44″ E long. 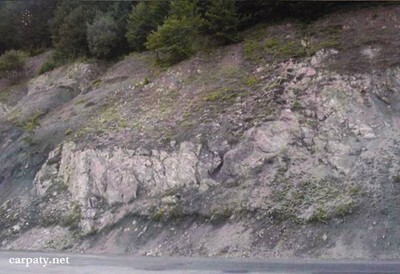 In the technogenic hollow along the Kyiv-Uzhgorod highway there are exposed large (some tens of rheters) blocks-olistolites of Eocene red calcareous argillites within dark-grey flysch rocks of Oligocene Krosnenska Suite. Outcrop is up to 25 m high and more than 400 m long. Occurrence of these exotic rocks allows reliably definition of this part of Krosnenska Suite as olistostrome unit and also clearly suggests for existence in Oligocene Krosnenska Zone of the steep, high and moving under-water cordillera which was composed of red-colored Eocene rocks. And even in conditions of good exposure one can rarely observe the same elsewhere in Carpathians. Accessible by motor-car. Highway Kyiv-Uzhgorod, 2 km to the south from road bridge over Latorytsya River. Legally the object as geological landmark is not defined yet. It is suggested to give the status of geological regional-rank landmark. « VOLCANICS OUTCROP “CHORNA GORA” (“ВLACK HILL”).